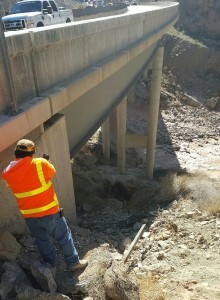 MOHAVE COUNTY, Ariz. — An Arizona Department of Transportation construction worker operating a motorized sweeper fell more than 75 feet off a cliff Wednesday and was assisted out on foot by emergency personnel, injured, but alive. The man was transported to the hospital in stable condition. 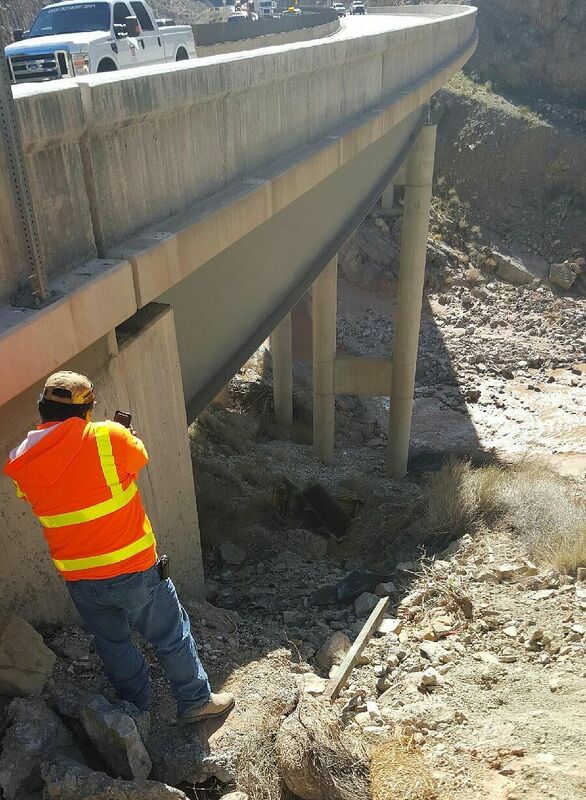 Just after noon Wednesday, the St. George Communications Center received a call reporting an accident on southbound Interstate 15 near mile maker 16. The communications center dispatched emergency responders to the scene and requested Life Flight be placed on stand-by, Beaver Dam-Littlefield Fire Chief Jeff Hunt said. Upon arrival, emergency personnel found that a 20-year-old male who had been operating a street sweeper went off the side of the cliff, falling at least 75 feet to the bottom. After hiking down the ravine, they found the sweeper upside-down under the bridge with the worker still inside, injured, but awake and alert. The man appeared to have a fractured jaw and, after being stabilized where he landed, the man was able to make the hike to the top, aided by emergency personnel. At that point, the man was transported by Beaver Dam-Littlefield Fire and Rescue to Mesa View Regional Hospital in Mesquite, Nevada, in stable condition, Hunt said. “That man must have fallen at least 75 feet, and at least 20 of that was a free-fall,” Hunt said. “The fact that he sustained the injuries he did is surprising, considering the fact that Life Flight was put on stand-by because of the nature of the fall, and the distance that he fell,” he said. “Something was looking after him, that’s for sure,” Hunt said. It appears that the worker came too close to the side of the cliff while operating the sweeper on a strip of pavement in the construction area, and once he started to fall, there was no stopping it, Hunt said. “A tow truck was called, but that sweeper was still at the bottom of the ravine when I left, and it’s going to more than likely take a CAT to get it out of there,” he said. Arizona Department of Public Safety and Beaver Dam-Little Fire and Rescue responded to the scene. Life Flight was cancelled after responders found the worker and assessed his condition. He fell 75 feet or he fell 20 feet? Image looks like much less than a 75 foot drop. judging from the pictures, maybe during the fall he hit a post as it fell? and then that would cause it to roll or flip and land upside down or angled.. AND those trucks can be BIG so if it landed long end down that would take at least 20 feet off the fall.. so yes it is possible to fall 75 but then “not really” but then “yes 75 feet”…. and it looks like 75 feet to me or close 65 to 75 the first responders are pretty good at measuring. they have to for hikes and climbs all the time. That’s gonna hurt for the rest of your life….go with medical marijuana instead of pain pills. Build the wall and light a bong ! TRUMP FOR PRESIDENT !